एक गौर-तनु एक नील -तनु , दोउ नैनन-तारो ! इक धारो नीलाम्बर अरु इक , पीताम्बर धारो ! इक सोरह -श्रृंगारहिं छबि इक , नटवर-छबि वारो ! इक भोरी अति इक अति चंचल , दोउ त्रिभुवन न्यारो ! कह 'कृपालु' जब होती होड़ दोउ , कोउ नहिं कोउ हारो ! भावार्थ ---प्रिय - प्रियतम दोनों ही हमारे सर्वस्व हैं ! एक गौर-वर्ण और एक नील -वर्ण के हैं तथा दोनों ही मेरी आँखों के तारों के समान हैं ! एक नीलाम्बर धारण किये हुए है एवं एक पीताम्बर धारण किये हुए हैं ! एक सोलहों श्रंगार से अलंकृत हैं एवं एक नटवर वेष से अलंकृत हैं ! एक स्वभावतः अत्यन्त भोली हैं , एक स्वभावतः अत्यन्त चंचल हैं ! दोनों ही संसार से निराले है , क्योंकि दिव्य चिन्मय हैं ! 'कृपालु' कहते हैं जब दोनों में किसी प्रकार की रसमयी होड़ हो जाती है तब कोई भी किसी से हार नहीं मानता ! क्योंकि स्वरूपतः परमार्थतःदोनों एक ही हैं ! 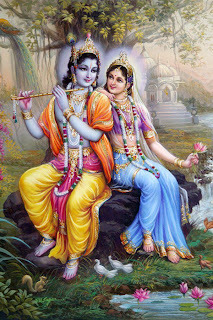 -----जगद्गुरु श्री कृपालु जी महाराज. प्रश्न - हमारे सेव्य कौन हैं ? fe, details the path of bhakti yog, and outlines the essence of Hindu religion. See below for the television timings of Shree Maharajji's speeches. Bade bhag paeeb satsanga, binuhin prayas hohin bhavbhanga. Sab kar phal Hari bhagati suhaee, so binu santa na kahun paee. Parikshya lokan karmachitan brahmno nirvedamayan nastyakritah kritena. Those who practiced the worshipping rituals prescribed in the Vedas and who realized the limited and temporary material and celestial consequences of these actions came to the conclusion that the supreme divinity could not be achieved by self-effort. To know God, Gurum eva abhigachhati, one has to completely surrender to a Guru. 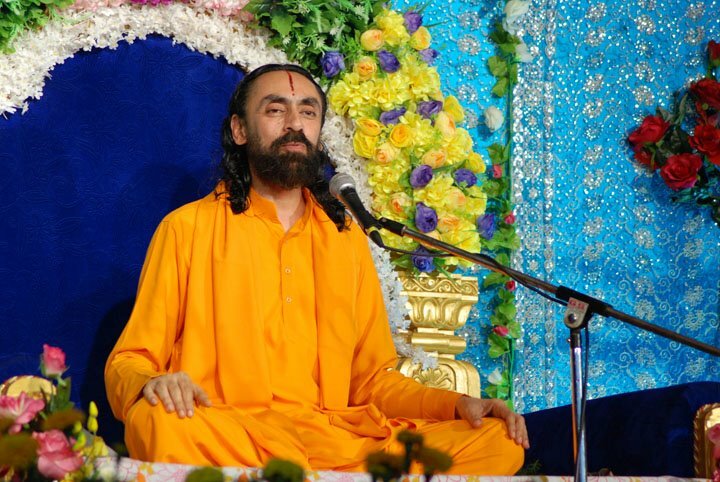 Such a Guru has two qualities – he has a thorough knowledge of all the scriptures (shtrotriyam) and He is established in supreme divine bliss (brahmnishtham). All of us have many powers – the power to see, to hear, to think, and so on. If a particular power reduces for someone, that person becomes handicapped. For example, if someone says, “I am blind,” it means that the person’s power to see has finished. We need multiple powers to accomplish any task. However, the powers that we souls possess are limited both in number and in quantity. God is called Sarva-shaktimaan, which means He is all-powerful. He possesses innumerable powers, and each is unlimited in quantity. It is by virtue of these energies that He is full of knowledge, full of Bliss, the Creator of the world, and the accomplisher of humanely impossible tasks. He creates this world out of His material power, called maya. He also has a superior spiritual power, which is called Yogamaya. You can imagine that if God creates such an amazing world out of His material power, how amazing will His spiritual power be? All the Divine leelas of Shree Krishna and Shree Ram that we read about were accomplished by the spiritual power, Yogamaya. “Look at the glory of love. 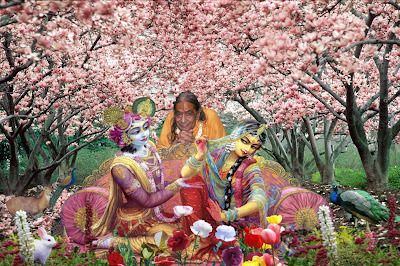 That Supreme Lord, Who hesitates to reveal Himself in the samadhi of great personalities, like Shukadev and Sanat Kumar, goes uninvited to the house of the gopis of Braj.” The wonderful amazing leelas, or pastimes, revealed in the above verses show that God is Himself under the power of Divine love. A very sweet pastime of the Lord that illustrates this point is described below. 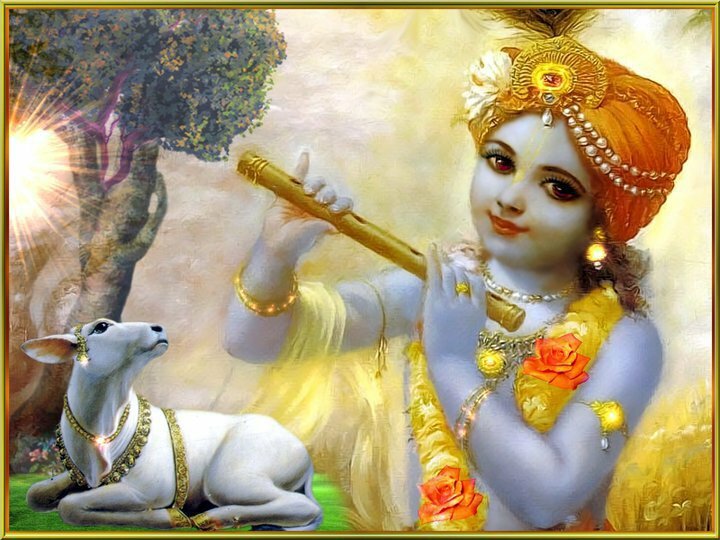 The Supreme Lord descended in the world as Shree Krishna, and performed loving pastimes with His devotees. Although He is the Lord of all the worlds, He became a little child, who played with His cowherd friends and stole butter from the gopis. Shree Krishna reached the scene. Seeing His mother busy with churning butter, He desired her affectionate attention. So he climbed into her lap, caught her face with his tiny hands, and tried to make her look in His direction. Seeing her dear Krishna’s naughtiness gave great pleasure to Mother Yashoda. She began feeding Him milk with great love, and fondling Him affectionately. Krishna was enjoying His mother’s affection. In the meantime, the milk in the pot on the fire started boiling and overflowing. Seeing this, Mother Yashoda hurriedly put Krishna aside and ran to take the milk off the fire. Krishna was annoyed that His mother had left Him to tend to the milk, as if it were more important than Him. To let Mother Yashoda know that He was angry, He took the churning rod and smashed the pot of butter. He also broke some more pots nearby. Then he carried a small pot of butter out of the house. He ate some butter Himself and began feeding the rest to the monkeys. Having taken care of the milk, Mother Yashoda returned to the butter. She was shocked to see all the pots smashed. She decided to teach her little son a lesson, and taking a rod in her hand, she came out of the house. Finding His mother so angry, Krishna ran to save Himself from a beating. His four steps were equal to one of Yashoda, as she chased him. However, He was still quicker than His mother, and she became tired. The Lord is faster than the fastest, and so who can catch Him? However, seeing Yashoda’s tired state, Krishna felt pity on her, and pretended to get exhausted Himself. He slowed down, and Mother Yashoda caught hold of Him. God is the Father of all souls, but because of Yashoda’s love, He had subjected Himself to the role of her child. The mother has the right to punish her child for his betterment, and so Yashoda took a rope to bind Krishna to the grinding wheel. However, the rope turned out to be two fingers short! So Yashoda tied a second rope to the first one and again tried to bind Krishna. But again the rope was two fingers short! No matter how many ropes Yashoda kept adding, the rope was still not long enough to tie Krishna.God is bigger than the whole universe, which resides inside Him. Unless He Himself allows it, who can ever tie Him? “Can any devata be considered as fortunate as Mother Yashoda? 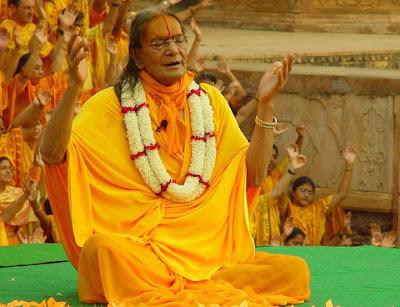 That Lord, who releases the souls from the bonds of maya, has been tied with a rope by her, and He is begging her to release Him.” This amazing pastime reveals the glory of Divine love, and shows how the devotee can bind the Supreme Lord with his or her love. Narad said, “Father, if you do not wish to believe me, I am going.” Narad Muni went away. 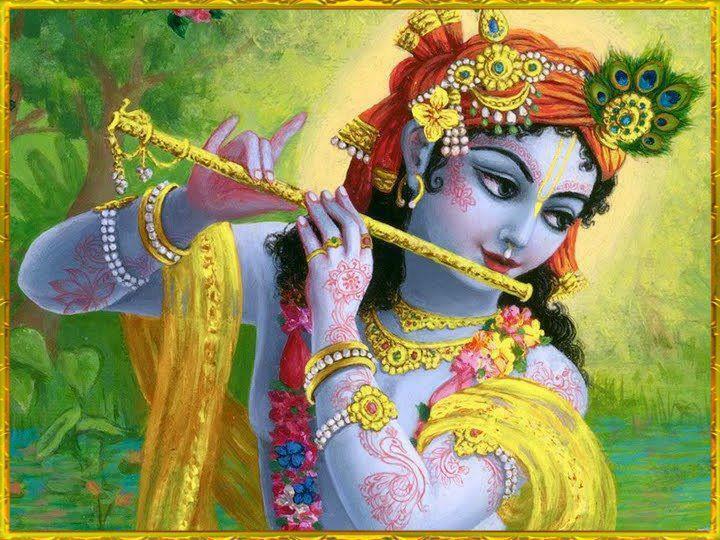 For the all-knowing Lord Shree Krishna, it was not a problem to know what had happened. He decided to teach Brahma ji a lesson. So He made His form like Brahma and went to Brahma-lok, the abode of Brahma. There He told the guard, “A false Brahma will come shortly. Do not let him into the palace.” The guard agreed to do as he had been told. Then Shree Krishna took on all the forms of His cows and cowherd friends Himself. In each form, He kept doing all the work as usual. So neither the mothers of the children, nor anyone else in Braj came to know that the real children had been taken to Sumeru Mountain. 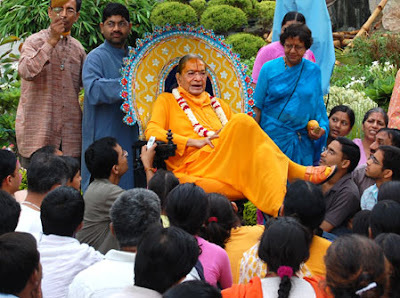 After hiding the children, Brahma ji returned to his abode. However, he was stopped by the guard who accused him of being a false Brahma. Brahma wondered what the matter was, and suspected that it may have to do with the boy in Braj. He went quickly to Braj on the earth planet. However, by earthly calculations, one full year had passed. What Brahma ji saw completely amazed him. Just as before, Shree Krishna was sitting with his cowherd friends, eating their remnants, while the cows grazed nearby. Brahma ji was shocked. He went running back to the Sumeru mountain. There he found the cowherd boys and cows, just as he had placed them. Then Brahma ji realized, “Oh my God! That boy is the Supreme Lord Himself.” He returned to Braj again to apologize. 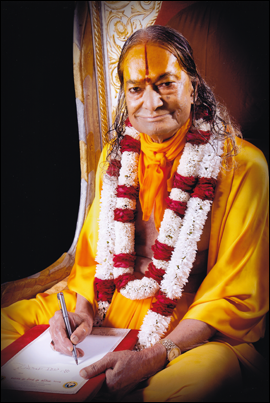 There are hundreds of such pastimes, which reveal how God forgets His Almightiness before His devotees. He becomes their Friend, Child and even Beloved. These leelas are revealed in the Vedic scriptures, which is one of the many features that make Hinduism so special. Divine love is such a power that if someone possesses it, God happily serves that devotee. That is why in the Mahabharat, Shree Krishna drove the chariot, while Arjun was merrily sitting on it. Shree Krishna is the Supreme Master of the universe, while Arjun was a mere soul. However, Arjun was such a soul who possess Divine Love, and hence Shree Krishna took the position of serving Him. However, since it is such an invaluable thing, God does not give Divine love easily. We must now try to find out how we can receive this priceless treasure. Shree Krishna holding the padukas of Nand Baba on his head. Nand Baba sitting on his throne, looking at Krishna with love. Mother Yashoda trying to tie Shree Krishna to the mortar wheel with a rope. Brahma ji offering his obeisance to Shree Krishna who is about five years old. Use a standard photo of Partha Sarthi. Shree Krishna driving the chariot, while Arjun is sitting on it. Swami Mukundananda is an IIT and IIM alumnus, being an exponent of the Material Managerial skills and having undergone a rigorous internship under the divine guidance of his Guru, Jagadguru Shree Kripaluji, Learning the details of The Spiritual Science. 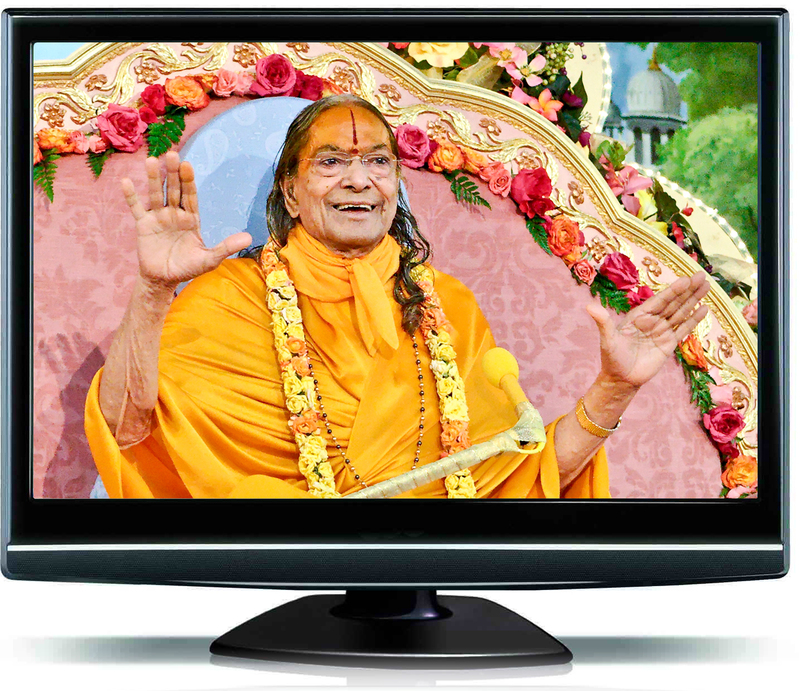 By the Grace of Shree Kripaluji Maharaj, Swamiji has been teaching this unique art of managing one’s minds across the globe for more than past twenty-five years. 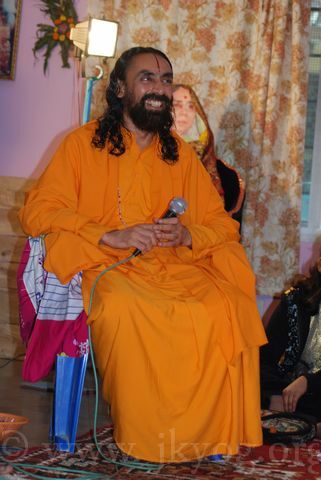 An uncontrolled mind is the subject for the vagaries such as lust, anger, greed, fear, jealousy, vanity, anxiety etc. that torment a person endlessly. To curb this infirmity, many people practice the art of positive thinking through their will power, not knowing that a human mind is helpless to bear the past karma. 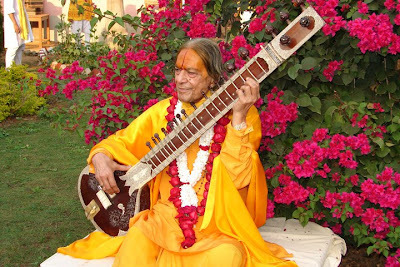 The Vedas, however explain that without a proper spiritual insight and proper self-knowledge, all means practiced to conquer the mind are fruitless. It has been revealed in the Vedas, It is the Mind only that is the Root-Cause of Physical-Mental imprisonment and Liberation (Amrit-Bindu-Upanishad Shloka 2). What is this Mind, then? The Scientists fail to penetrate to the subtle mind, as they consider the brain as the mind. Brain is only a central processing unit, hard-wired with the physical organs of the body such as hands and legs. Moreover, while the Psychologists do admit the existence of Mind, they refrain from admitting the existence of Soul, the neutral source of Energy, through which, the mind functions. Mind has been revealed as a subtle (not abstract) machine, through which a soul experiences and interacts with, the external world. A soul’s likes, dislikes, desires, tendencies, instincts are all stored in a part of our subconscious mind. Mind, however, functions in various modes and stages. Primarily, the subtle human mind can be divided into Four Partitions. Mind you, it is the one single mind that enacts four different roles simultaneously, as revealed in Shreemad Bhagavatam Puran (3.26.14). The mann instinctively makes sankalpas and vikalpas or desires of sense gratification. The mann is heavily affected by the surroundings and past karmas of a soul. This being mind’s inherent function, the mind cannot be deprived of making desires. 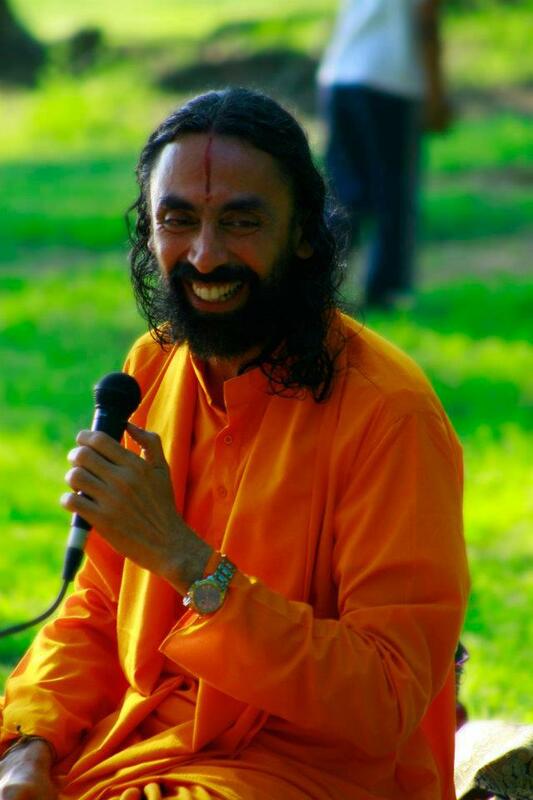 There is not a single moment, where mind can stop making sankalpas and vikalpas. (Shreemad Bhagavad Geeta 3.5), knowing this well, instead of annulling the mind, the devotees try to diver the thought-flow towards the Spiritual Realm by constant remembrance of the Lord’s Names and Divine Pastimes. Once the mann decides a particular thing or hatches a particular desire, the data is further processed to the Intelligence, where it is weighed taking into consideration social viability, status, personal image and other material constraints. Both Mann and Buddhi carry out their jobs with the alliance of the memory faculty, wherein samskars (neural-images) of past infinite births are stored in the mind. Once the Buddhi weighs viability and feasibility of a particular desire, the more evolved or status-conscious individuals churn the application furthermore in this highly advanced and subtle machine called chitt. Most of Para-psychologists, yogis and munis fail to breach the code of this subtle organ. Ahamkar is not ego but the inherent sense of I or ‘I’-ness. It is of two kinds, the unreal and the real. The material Ahamkar, that of considering one to be a body or a sense of belonging to a particular cast, nation, ethnicity, species etc., is false ego. Whereas, considering one to be a Pure Atomic particle of God’s Marginal Potency aka Atma is Real Ego. Human Mind can be divided primarily into three stages based on the level of its consciousness about its own entity. Conscious Mind: Conscious mind is the mind that one is conscious about. The habits that we know we have, our limitations, vices, infirmities etc. Subconscious Mind: Subconscious Mind is that sphere of our mind that we know but we cannot express through words or gestures. Unconscious Mind: This more than 99.99% of our mind. All the material aspects that we do not know are stored in the unconscious mind of a soul. 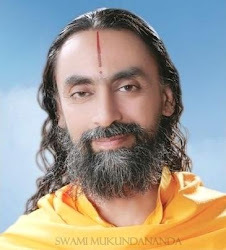 Super-conscious Mind: This is the mind of a turiyaatita yogi, whose consciousness is able to reflect its optimum capacity, but this also is limited to the relativity of the yogi. It would be indeed very incompetent to conclude that such an individual receives the cosmic consciousness. 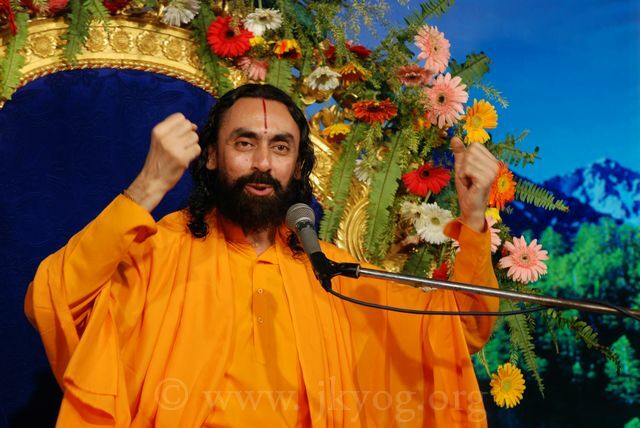 Divine Mind: This is a mind of a pure devotee who has been impregnated with Pure Love of God by his/her Guru.